Having a proper warm-up protocol for your roasting is essential to making your first few batches of the day work. There’s surprisingly many roasters that have such a time-efficient warm-up protocol but who keep having issues with their first roast, be it reaching the targets or even properly developing a high-density coffee. Every roaster needs a different warm-up procedure, based on size, mass of the material, roasting system, etc. Generally this takes at least 30 minutes. 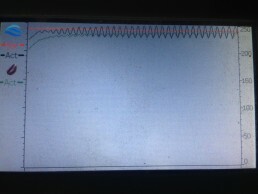 This graph shows my warm-up protocol on a Giesen W6. The Giesen gas system is self-regulating, so you will see fluctuations in air temperature around a set temperature. Over time, you see the bean temperature in the drum slowly reaching this air temperature and then steadying. To me, this indicates the conductive energy transfer to the drum is the same as the thermal energy loss, so the drum is at the temperature I want it to be. In this setup, I use 240 degrees Celsius as the target temperature for the drum, yet other systems may require different temperatures. I suggest any roaster to properly put some effort into their warm-up protocols. It saves coffee by creating a stable and reliable first roast of the day, and your roasting schedule gets more flexible if you have the freedom to start your day with the highest density coffee.